I was feeling a little bored with the sets I had around me, so I went back into the stamp storage drawers and pulled out this set, Beautiful Beach. I like this one SO much more than the current beach and shell set. I find it very serene and automatically go towards more muted colours when using it. I went for two very different looks with this set. For the first one, I went with some vellum tearing, white craft ink sponging, and twill tape. I stamped Canvas onto the vellum, and softened it a bit with a sponge. I also sponged white ink all around the edges of each vellum layer. 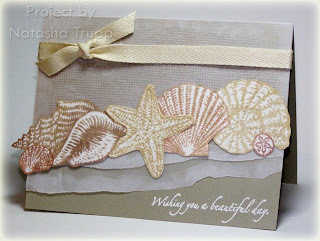 I stamped the shells on white paper and cut them out, arranging them over the waves of torn vellum. 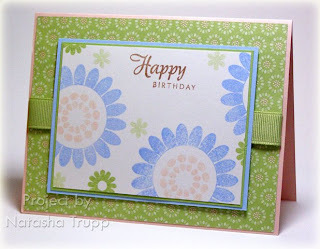 I embossed a greeting in white, then added some twill tape along the top. I really love how this one turned out! Funny thing about the seashell colours. Apparently I hadn't washed them since using them last time... I used the same ink pad on each seashell and whatever colours I had used on them previously mixed really nicely with the Palette Ink Haystack! Go figure! For the second card with this set, I thought that blues would be nice. I started off with a once stamped off Bordering Blue seashell. 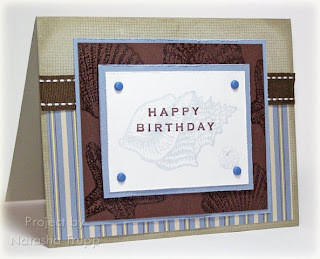 I placed a birthday greeting over top, added some brads and lots of distressed edges. The chocolate layer behind it has some embossed seashells. Originally I was only going with to use bordering blue and sahara sand, but then I found this striped paper from a few SU! catalogs back. The ribbon is some nice saddle stitched grosgrain that I got in a grab bag from Dunwoody Booth. Well, it's almost April now, and there's still more snow on the ground than I'd like to see. It's melting slowly, but I cannot wait for that spring green to start busting out everywhere. I can't help but think of April last year and how by the end of the month, the garden was full of tulips. In the meantime, here's a few cards using some hoarded Petal Patch paper. I love this paper and use it sparingly. I found that these flowers from gel-a-tins Sparkle & Shine set were of a similar shape. I took my colours from the paper and went with some basic layouts. The greetings comes from Verve Visual's Happy Thoughts set. Here's a sneak peak at the new Flourishes release. 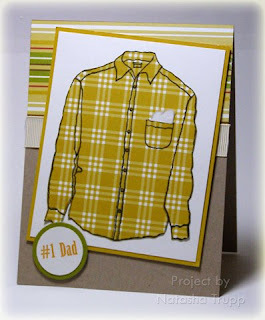 It's called Menswear and contains a great collection of images and sentiments for the guy in your life. The shirt in this set works great for the paper piecing technique. I stamped this one on some SEI patterned paper, cut it out, included a little hanky in the pocket, and placed that on white paper. 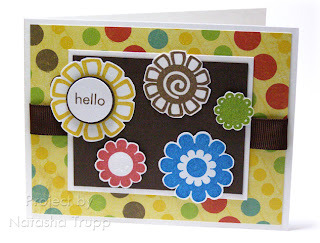 I placed my greeting on a few circle punch outs, and made the card a bit more interesting by throwing on some other patterned paper. I also thought an angled layout worked better with the images and patterns here. I can never get enough stars. 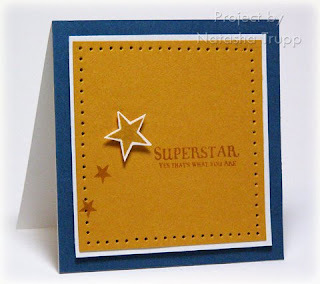 I have star stamps, star sentiment stamps, star embellishments, star nestabilities, and more! 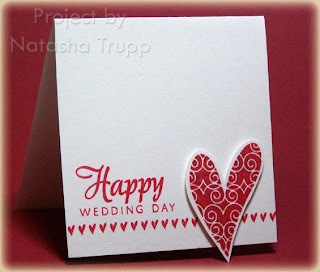 I also really like pairing really big greetings with really small ones, like on this card. I stamped the word HAPPY with gel-a-tins' license plate alphabet. I mounted that on some textured red paper and put that on my card base. Next, I die-cut out some stars from more textured paper. 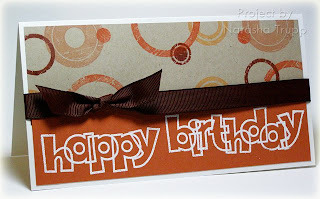 On the one, I stamped the small birthday greeting (that one is from Verve's Happy Thoughts). I arranged the stars around the greeting, and that was that! I always like the look of a soft spectrum of colours with a word background. This card started out with the panel, then I just went from there. For the spectrum, I sponged on Apricot Appeal, Pretty in Pink, Almost Amethyst, then Bashful Blue. 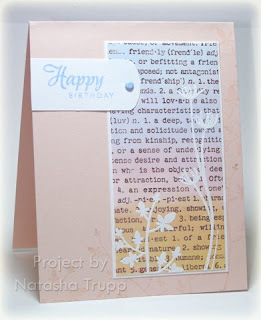 I stamped Friend by Definition over top with Stazon Timber Brown. 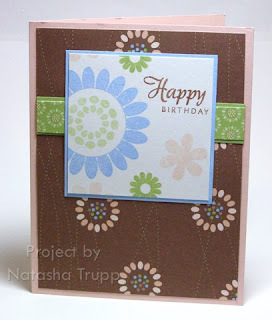 The next step was to add some bolder floral images and embossed them with white embossing powder. It's hard to see, but on the blush card base I stamped more of the silhouette flowers in a flourished corner kind of pattern. The greeting tab was made by using a 1-inch strip of paper and feeding it through the key tag punch so that only one end would be punched. That's the sound of inspiration hitting. I spotted Kristina's colour inspiration challenge and saw that the deadline was tomorrow at 5PM. Well, that was hardly enough time to wait until tomorrow to make a card, so I found myself making this one tonight. Originally I was going to do some chipboard, but that takes too long. Instead, I traced a bigger flower chipboard shape onto white cardstock, cut it out, applied some black rub-ons, then matted that on black cardstock. I also freehanded some smaller black graphic floral shapes and matted those on white cardstock. I applied some more rub-ons, including the greeting, onto some polka dot patterned paper, added some ribbon, and threw it all on this 3-1/4x6 format card. I like the card because it's a lovely collection of brights that I wouldn't normally throw together. It's also kind of a funky layout. It's really nice when inspiration just hits, you know? 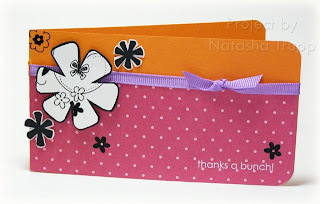 I felt like making a pretty scene with these flowers from Verve Visual's Thankful Blossom set. I stamped them all over then proceeded to colour them in with Stampin' Up! markers. I used those ones because I didn't want the colours to bleed through. I stamped the butterfly on another piece of white, coloured it, cut it out, then scored it at either side of the body, next to the wings. 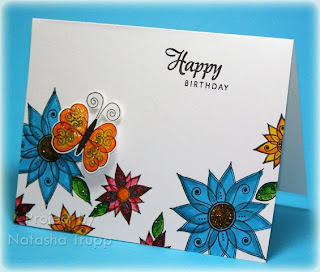 I attached that by a few pop dots, then added stickles to several items on the card (the flower centers, leaves, and the butterfly). I've been on another birthday card binge lately, so you'll be seeing quite the variety of birthday greetings throughout the week. This first one is for my sister's boss. I wanted to do something besides my fall-to layout that I've been using lately, so I started browsing through some of my favorites as SCS. I spotted this gem by Yvette and was instantly inspired. 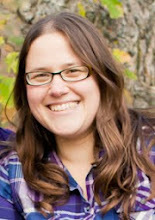 I liked the layout and the little details she did on each layer, so I incorporated those same elements into mine. 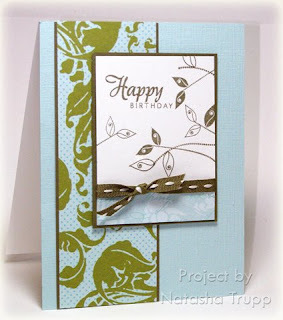 The bottom olive panel is an embossed background stamp. The sentiment is showcased in an oval frame. I used silver hardware instead of just the punches. I did a little bit of piercing along the cranberry panel, but just left is piercing, instead of faux stitching. I also did some sponging on the main panel to bring in the earthy look. So I've had this white flocking powder since the summer and I rarely use it. I finally found the perfect use for it! 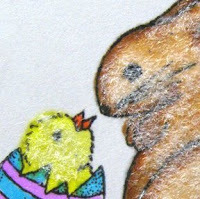 This bunny and chick image from Flourishes Easter Bunnies was perfect for flocking. First I stamped the image with Palette Noir. I let it dry for a few minutes, then I coloured it in with Copics. This is important since the next step was to use white glue overtop. If I had used the waterbased markers, there might have been some colour running! Then I poured the flock over and patted it gently into the glue in some spots. I love the fuzzy look! Here's a close up of all the fuzzy cuteness! 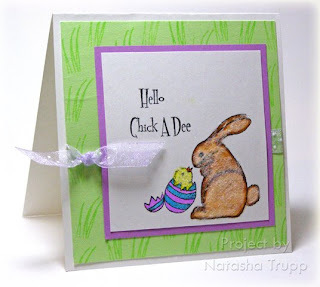 Just a pretty Easter card for this Saturday. 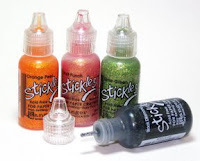 This image is perfect for watercolouring, especially with the twinkling watercolours. They have such a beautiful and subtle shimmer to them. Okay, so I felt a little more inspired today. I took a stab at the challenge. My original challenge card was a long card and used shapes and shadows. It just wasn't happening, so I started anew. These colours were actually inspired by the paint palette we are looking at for our livingroom/diningroom/kitchen. 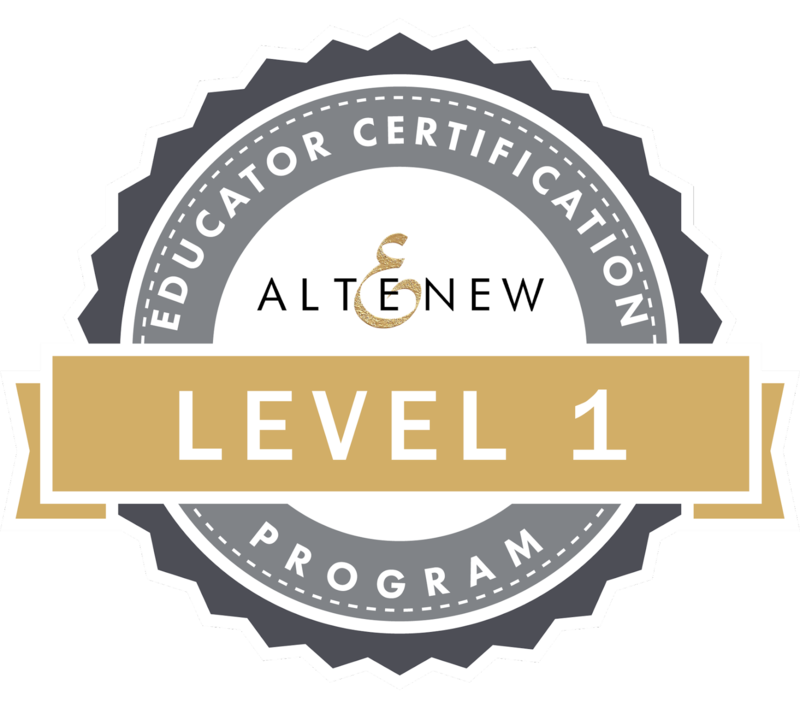 For this one, I got out the first set that I earned at the first workshop I hosted at my house-All the Best. I also used some alphabet stamps that I've had for at least a year but rarely look at. The patterned paper is retired from last year. I also used two of the 2006 in colors- Thyme and Cranberry. While I was making this I felt a little bad about using my nestabilities. However, I just checked the date I received them- Sept 26. So it's almost been 6 months... The brad next to the word thanks is the swing mechanism for this circle card. This layout was in my book o'sketches. However, I believe that sketch was loosely based off of Kristina's card. Remember, if you want to see everyone else's creations, check them out here. It's that time again, my youngest cousin is having a birthday soon, so I had the challenge of making his card. Last year he got stars, so I didn't want to do that again. I have found generic shapes to be accepted well from the teen age group. I decided to go with circles (these ones are from Spin Cycle). I chose a masculine palette and got to work. I also love the effect of overlapped outline fonts, so I did that with the build a set lowercase. I embossed those for added 'pop'. Although ribbon isn't typically a masculine embellishment, I feel it can really work when used in the same turns. The wide grosgrain especially seems fitting. This card is quite large- 4.25x8. It is the perfect size for every teen's favorite gift- money! So, it being the 20th of the month, it's time for another dirty challenge. I haven't gotten around to mine yet, maybe later. In the mean time, here are the details. Challenge Focus: Use one of the oldest stamp sets you own along with embellishments and supplies you've had for what seems like forever. Required Element: RAK - you must mail your card out as a RAK on 3/20 to any DD/DDA - could be a birthday, get well, thinking of you, invite to come play with us, congratulations or just totally random no particular reason RAK. You do not need to tell us who you mailed your card to. Restricted Element: No stamps, tools, or supplies purchased or obtained within the last 6 months. We're on the honor system here girls, so use your judgement to keep within the spirit of the challenge. Bonus Challenge: Use a technique or style you haven't used in a long time, but was a favorite at some point in your stamping past. 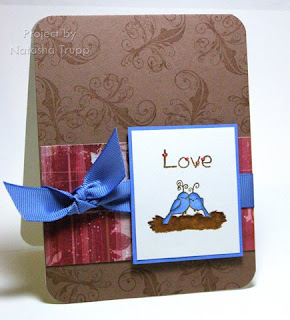 I really love this pair of birds from Flourishes' Love Nest. They are so sweet! 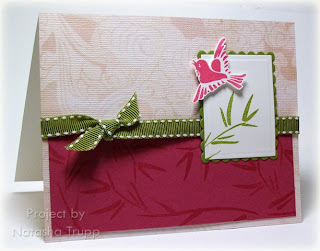 For this card, I did a tiny bit of masking with the birds and the nest. These were coloured in with Copics. I figured Bluebirds would be the featured bird today. The cocoa background is stamped with a flourish from the Mardi Gras set. The patterned paper was taken from a 6x6 Basic Grey Perhaps paper pad. There's also a touch of stickles on the little hearts of the word Love. So, I'm not really sure what brought this colour combo on, it just happened. But you know what, I really like it. The small bits of rust and grey with the turquoise really is pretty. For the large flower, I stamped it with Palette ink, let it dry for a while, then coloured it in with some markers. I jazzed it up a bit with some turquoise stickles and a white gel pen decorated rust button. I used the smaller blossom to make some pretty, coordinating background paper, added a bit of shimmery rust ribbon (that's from an American Crafts boxed set, all rust ribbon in assorted styles). Earlier this weekend, I wasn't feel very inspired. When that happens, I find that making ultra-simple, 3x3 cards really helps out. 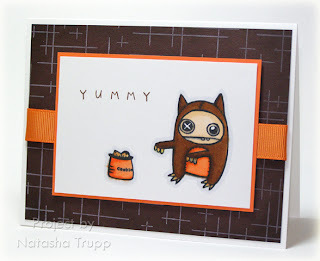 Since I have been on a Verve Visual kick, I figured I'd make some cards with the new stamps. First up, the Starlight, Starbright. I started with the sentiment (love this one, there's really not enough sentiment stamps out there calling people superstars!). 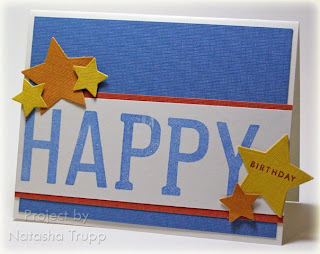 Next, I stamped a star on some white, cut it out, popped it up on the mustard and stamped a starry trail. I added a pierced border, and that was that! Next up, Wild Thing & Happy Thoughts. I hadn't had a chance to use these sets yet. The Wild Thing set is really more of a valentine's set, but I like the design of the hearts, and figured they'd pair well with the sentiments in Happy Thoughts. This card probably took 2 minutes to make. 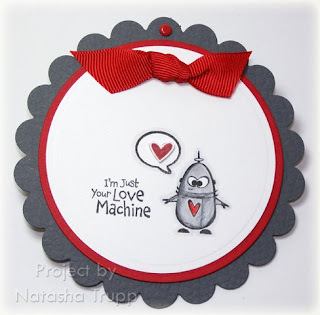 Stamp the heart border, stamp the sentiment, stamp a big heart, cut it out, and pop it up on pop dots. Done and Done. I had forgotten that I received some Scenic Route paper in my most recent payment package from Cards magazine. I really liked this paper from the Rockland collection- Franklin Street. It's double sided paper, so I used both sides on here. I found that olive and moss weren't quite right, so I pulled out a 2006 colour- true thyme. It's not a perfect match either, but it definitely worked. Plus, I still have matching ribbon! The sketch is one from my book o'sketches. The original sketch had a button on the left. 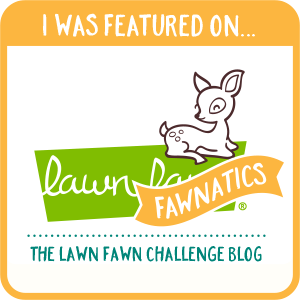 I believe I took this sketch from a Stampin' Up! catalogue when I was looking for layouts that incorporated buttons. When I'm doing my sketches, I rarely include the matting layers in my drawing. I find that the amount of matting definitely varies from card to card. If, while making it, I feel it needs something more or a separation of sorts, I will add the extra layers (like on this card). I received my Verve Visual stamps yesterday. Julee combines such beautiful graphic designs with awesome font combinations. In case any Canadians out there were fretting about ordering from them, they offer free shipping after $40. I received my order in just under 2 weeks, and there was no customs this time! Woot! I really love the sentiments that they offer, it seems one can never have enough of those! 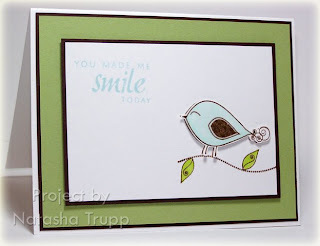 I thought this bird looked like it was be smiling, so I paired it with the smile sentiment. I didn't realize it until after, but I'm pretty sure this card by Lila was hanging out in my creative subconscious while I was making my card. Since I went with such a basic layout, I popped up the bird for a little bit of 3-d fun. I sketched down my interpretation of the sketch into my book o' sketches, then got to work. 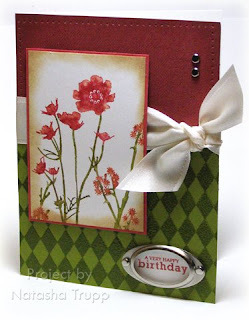 At first, I planned to do something with Bodacious Bouquet and the matching embossing template. However, the colours I chose were a bit too bright to easily dry emboss. I went with a floral Fiskars embossing plate instead. It's so much faster and a lot easier on the hands and eyes! I got that all done, then started on the stamping. That's all pretty straight forward. When it came time for the hardware, I had a bit of a dilemma. I had already taped down the layers, including the ribbon, so I needed to modify the sketch ever so slightly. Also, the hardware was silver and it just stood out too much. A sponge and a stazon jet black ink pad solved that problem! 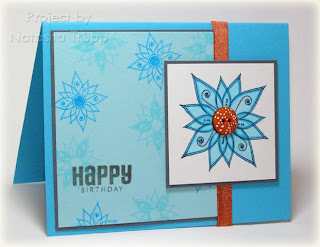 I've been seeing a lot of really quick cards using punches of circles or squares and patterned paper. 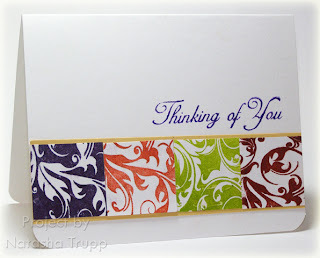 I thought I'd make my own patterned paper using the Damask and Reverse Damask, as well as a sentiment from Open to Love. I didn't happen to have a square punch handy, but squares are quick cuts. I cut a long strip (1-3/8'' wide) and started stamping the background stamps on it, then trimming each colour to a 1-3/8'' square. I mounted the squares on some saffron paper, then added my sentiment. I also rounded the corners of the card base, just to add a little something extra to the card. This layout is SUPER quick, and can work for any theme. In other news, make sure to check out Flourishes new Easter releases. There's a religious one here, and a fun bunny-themed one here . I haven't used any Stampin' Up sets in a little while, so I figured one was due. I pulled out this new favorite, Embrace Life, and started creating a floral panel with 2 of the images from this set. 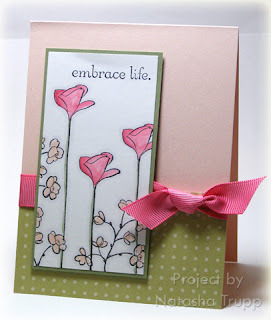 I stamped the long stemmed flower first, then kind of filled in the spaces with the smaller, fuller image. I coloured them in with SU! markers, with a little bit of touch ups with an aquapainter and reinkers. I also outlined the images with a light gray marker to add that little bit of 'pop' to the images. I don't think I've ever used so much blush blossom before this set. It just goes with it. I was actually kind of surprised with this colour combination, it seems bad in theory, but it really worked out! I remember hearing a bit of buzz about "see-D's" by Inque Boutique from the summer CHA show. However, I hadn't seen them at any retailers locally. I went to my local scrapbook store and finally saw an assortment of these stamps. Since they were so inexpensive, I decided to give this set a try. They stamp just like rubber stamps (since that's what they are), but they are cling, so they work on acrylic blocks. They have the image on the back side, so even though you can't see through them, you have a decent idea of where the image will end up. It comes with a stamping mat, which I used. I'm not sure if it's completely necessary or not. I like the bold fun images, but I'm not sure if I like the actual design of the product. For my unmounted stamps, I'm used to having EZmount. Also, even though the cling is guaranteed, it seems very much like a tape product. I think if I were to drop a stamp on the floor, it would pick up cat hair, paper scraps, and who knows what else. EZmount doesn't do that. Also, the stamps are just rubber, nothing more, so they are quite flimsy. The storage system is pretty good. Like I said, the price was right, and I liked the images enough, to give these a shot. Enough critique, here's the card! I used this paper as inspiration for my colours. This is the same layout as yesterday's card. Amazing what different papers, images, and colours does for a layout! And here's some Doodle Factory news for you... Have you seen the newest release?? They are AMAZING!!! Check them out here. My favorites are the two robots and the cityscape backdrop. I cannot WAIT to get my hands on these. Here's another swing circle card. This one features some Cat's Pajamas clearly swanky stamps from Loving Mew. I went with the same layout as yesterday's card. I coloured in the robot with prismacolor pencil crayons (silver, black, and red). The little heart in the speech bubble in popped up on a dimensional. 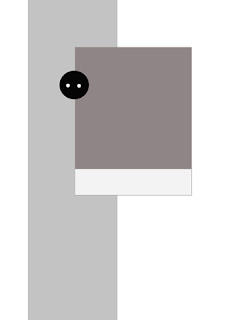 I liked the textured card base of yesterday's card, but I don't have any of the Basic Grey in a textured format. So I cut out the circles, then texturized them with Fiskars texture plates (check out instructions from Ellen Hutson here) . You can't really see the effect in the photograph, but I was just wanting something a little different. I have really been on a circle card kick lately. It's nice to change up the shape of your canvas now and then. 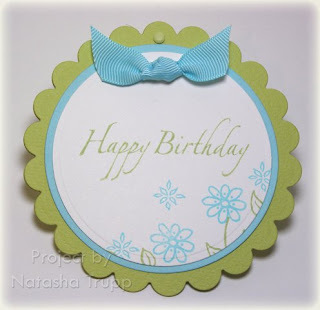 For this card, I used the largest scalloped circle nestability die and cut out 2 circles. I lined them up and punched a 1/8th hole punch through one of the bumps. This is where I put the brad which also acts as the hinge. 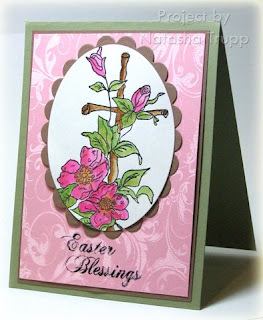 Next, I stamped a small floral scene using Flourishes Fantasy Floral Garden. I added in a sentiment from Many Sentiments. The finishing touch was a small piece of knotted ribbon. I got this 5/8'' grosgrain from Michaels this weekend. It's American Crafts and was on sale (woot!). For the inside of the card, I adhered a small white circle waiting to be written on. I think these cars from gel-a-tins Vrooom! are the cutest. This card started with me wanting to showcase each of the vehicles in this set. The best way to do that was to make some background paper. I chose 4 colours and started stamping. 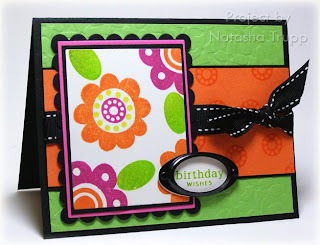 Next, I figured a card this bright and with this theme would be best suited for a younger child. 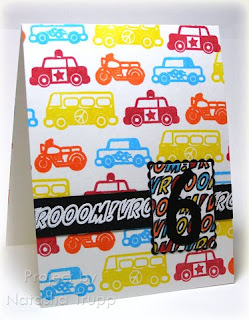 I stamped the word VROOOM several times, coloured in the letters to match the stamped paper, then embossed the number 6 over top. I also made some paper ribbon with a strip of black paper and white embossed Vroooms. The card ended up a bit busy, but I think it still works quite well for a 6 year old. I always like using this colour scheme for kids' cards. I just recently received gel-a-tins' Asian Garden. There have been several Eastern inspired products that I have seen lately and this set fits well with that trend. For this card, I started out with the small image first. I cut out a rectangle, embossed it, stamped it with the bamboo leaves, then mounted it on a scalloped rectangle. I stamped the bird, cut it out, and placed it so it appeared to be flying away. I found a lightly coloured pattern paper from the DCWV Far East mat stack. I also made my own patterned paper using more of the bamboo leaves. I finished off the card with some double stitched olive grosgrain. A little while back I saw this awesome card by Jill . It's funny how sometimes you can forget about the simplest techniques. 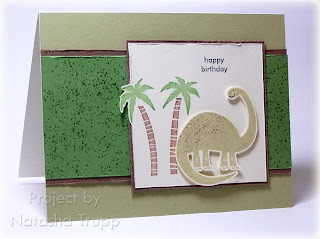 I loved the effect of the speckled stamp kissed onto the solid dinosaur stamp. I also loved the fact that she used the dinosaur paired with a cheeky sentiment. When I first saw this set, I didn't think "hey, what a great set for a little boy", I thought "hey, that would be hilarious for certain milestone birthdays for people who have that sort of twisted sense of humour". So I was thrilled to see someone else use it that way. This card has no cheeky sentiment, but I did use the speckled background to add some interest to the dinosaur. I thought river rock seemed like the perfect colour for a brontosaurus.